How can you know with absolute confidence that you’ve put together all the key elements of a winning product launch plan? If you prepare these 5 product launch plan documents, you can rest assured. We recently heard a B2B marketing professional say, “We don’t release new products… we let them escape.” He went on to say, “The bar was set so low, we tripped over it.” He was probably exaggerating-and hopefully your product launch process is much better-but is it as good as it could be? Over the last several years, AIM has helped B2B firms take their launch process to a higher level using LaunchStar® methodology and software. The launch team’s critical work is captured in 5 key documents. You can use these to “begin with the end in mind” (Steven Covey), essentially running a “QC check” on your company’s process. So let’s take a look at these five 2-page documents now, which contain a total of 22 sections (shown below in bold). Overview: This is the “grand-daddy”… the overall summary. Depending on the size of your launch, it may be the only document you need. It creates the framework for the rest of the documents below: 2. Prospect Profile (WHO we tell), 3. Message Brief (WHAT we tell), 4. Media Guide (HOW we tell), and 5. Launch Results (How we did). Audience: This is aimed at management approving your launch plan. But it is also a great way to communicate with key stake-holders, including your sales team. Components: Four sections are included, which give LaunchStar its name: Strategy, Team, Activities & Results. Strategy briefly describes the market, message & media. Team provides the names and responsibilities for the launch. Activities presents a month-by-month, high-level Gantt chart of key tasks. Results tracks post-launch sales and other metrics. Overview: The crystal-clear definition of your target market (WHO to tell) is your responsibility, not an ad agency or PR firm’s. @aim_institute. Do this well, and you’ll avoid squandering agency fees and promotional budget. Audience: Share this document with external agencies, and with colleagues impacted by the launch, especially your sales organization. 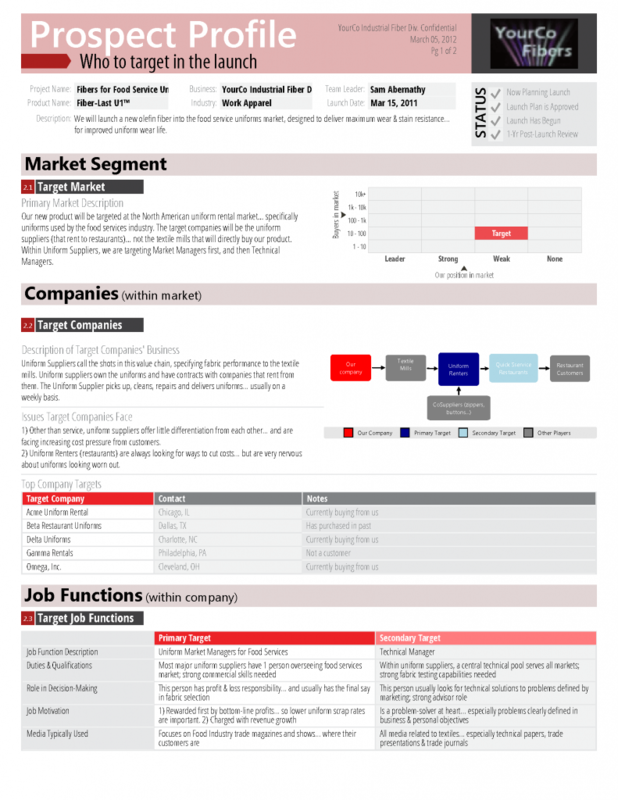 Components: Market Segment describes the target market and its nature…number of buyers and your current presence. Companies illustrates your value chain and typical prospects. Job Functions details the key buying influences to be reached. Key Outcomes describes customer needs and which your product will satisfy. Launch Survey displays the results of an optional LaunchStar survey revealing how this market already learns about new ideas. Overview: While an external agency may help you refine your message, the fundamental benefits your new product delivers (WHAT to tell) is something you must clearly define. @aim_institute. Audience: As with the Prospect Profile, share this with external agencies, your sales organization, and other stakeholders. Components: Product Overview describes the new product, its underlying technology and specifications. Customer Benefit compares your new product against next best alternatives for key customer outcomes. Central Message provides a crisp, memorable description of why customers should be interested. Positioning addresses five principles of product positioning. Pricing details pricing, discounts, customer value and justification. Offers describes how you will attract prospects at various stages of their buying cycle. Overview: Now you fully engage external agencies in optimizing a mix of 9 traditional and 9 online venues to reach your target market (HOW to tell). Audience: This document is created with your internal and external advertising/PR experts, and distributed to all launch stakeholders. Components: Market Dynamics addresses two key drivers of your media selection-number of potential buyers and your current market presence. 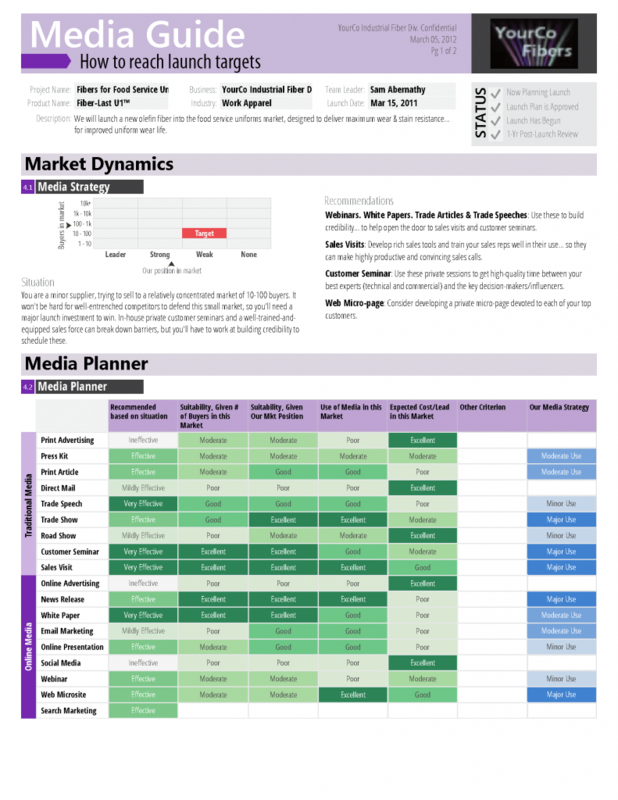 Media Planner displays the results of a launch team exercise, using key criteria to select from 18 media. Media Records provides a repository of important data on trade shows, trade publications, etc. 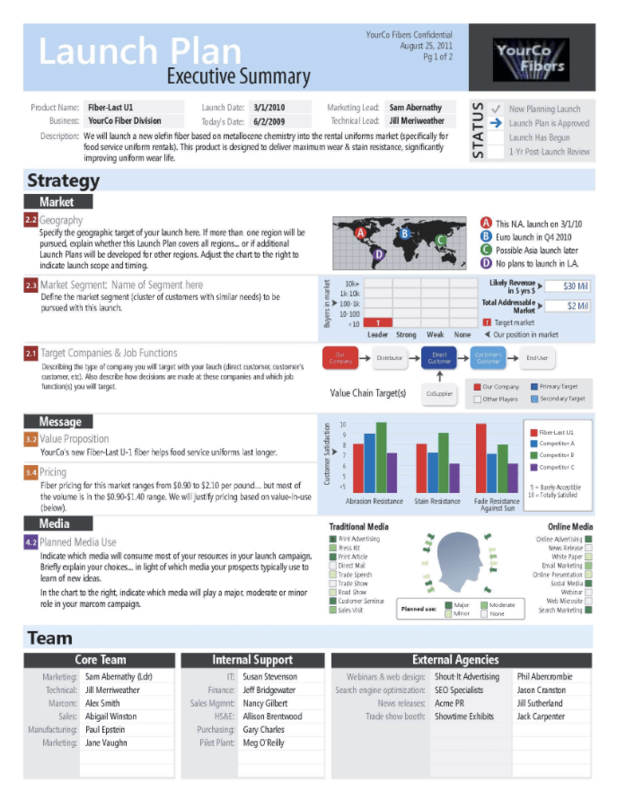 Overview: You begin using this document after your launch, to track sales and other metrics against pre-launch expectations. Audience: The principal audience is management, but this can also be used to maintain focus for sales and other stakeholders. 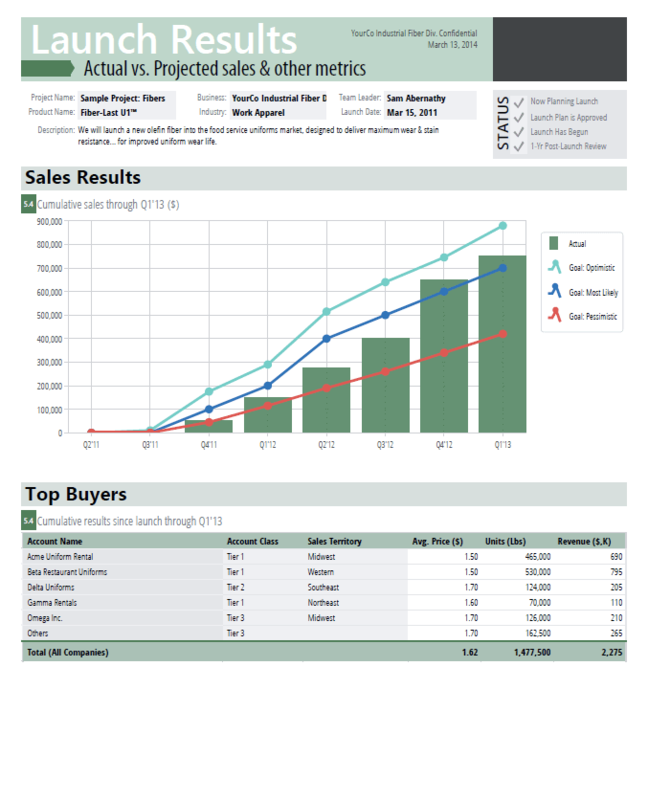 Components: Sales Results tracks monthly or quarterly sales vs. plan. Top Buyers monitors actual sales volume & price at key accounts. Lead Conversion follows the progress of customers along the buying cycle vs. plan. Metrics Tracking displays actual vs. planned results on metrics such as website visits, PR placements, inquiries, EBITDA, etc. 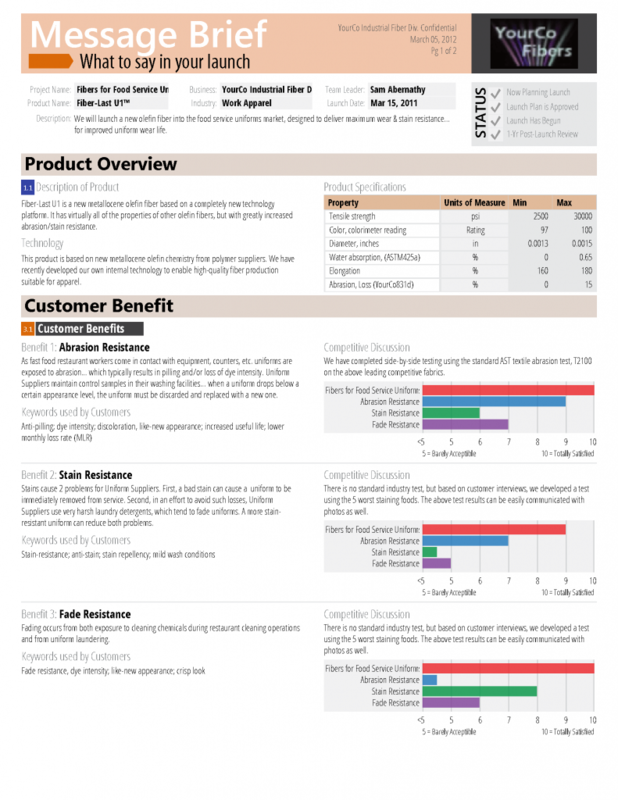 So, how do all these beautiful summary reports come together? Unfortunately, for many companies they don’t. That’s why we created LaunchStar, which automates this report creation based on simple inputs from your natural work flow. The software is much more than a fancy checklist, also helping you… craft your strategy… plan your budget… manage a task timeline… and attach/manage multiple other key documents. Your launch team will stay connected, too, since LaunchStar is web-enabled and keeps a synchronized master copy of your plan everyone can update! Of course, there’s no substitute for developing great new products customers really want @aim_institute: That’s why we spend so much time training clients in New Product Blueprinting methodology. But what a shame it would be to develop such products… and then just whisper about them when you should be shouting. If you’d like to receive PDF copies of these 5 reports, or have a private consultation with someone at AIM, please contact us to let us know. For general information on LaunchStar training and methodology, please visit B2B Product Launch.